A mortgage foreclosure happens when a lender exercises its lien against a borrower’s home in order to sell the house to pay off the mortgage loan. This only happens after the borrower has failed to make mortgage payments for a period of time. Step 1 - Notice of default is recorded by the bank. This happens after you’ve missed a payment, or sometimes up to four payments. Step 2 - Opportunity to reinstate the loan. Bring your loan payments current plus the late fees and whatever penalties are assessed, and you have just reinstated your loan. 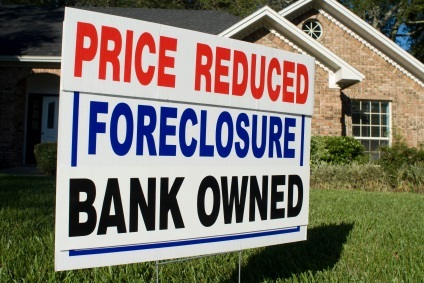 You’ve stopped the foreclosure. Step 3 - Date of foreclosure is set by the bank. Typically, the date is three months (about 90 days) after the bank sets the notice of default. You are allowed to live in the house until the actual date of foreclosure.. Step 4 - Notice of trustee sale is prepared, published and posted. The bank will publish the notice (you’ve seen those notices in your local newspaper), mail you a copy and post it on the outside of the house. Step 5 - The house is sold at a foreclosure auction. If you are still living in the house and it is sold at auction, the new owner can have the sheriff evict you within 24 hours.